No matter how good the movie is supposed to be it's still hard to get excited about watching a holocaust movie. It's just such a depressing topic and movies are generally used as an escape from reality. However, sometimes it is important to use the medium as a mirror to reflect the worst of what human beings are capable of. While he may or may not be a sleazebag, director Roman Polanski (himself a holocaust survivor) demonstrated a masterful touch in telling the story of Polish holocaust survivor Wladyslaw Szpilman. 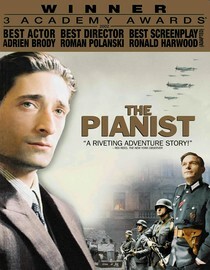 Everyone's favorite lanky actor, Adrien Brody, gave a brilliant performance in this film that he'll probably never again be able to match. He apparently went to great lengths to realistically portray his character, going as far as actually starving himself during shooting. He was really incredible and definitely deserved the Oscar he received for his performance. The story itself is gripping, horrifying and at times seems almost surreal. What the Nazi's did was so unbelievable that it even seemed unbelievable to the people it was being done to at times. It's an awful, depressing tale told in a brilliant and moving way. You really can't help being riveted by this movie. If you've never seen this movie before you should take the plunge and check it out. It really is a brilliant film. According to instantwatcher.com this movie will only stream until 3/15/11. Why is it in your queue? Somehow I never got around to watching this movie till now even though it was supposed to be really good. Most memorable moment? The guy towards the end that gives him the coat. What mood should I be in to watch this movie? In such a good mood that it won't send you into depression.